Art deco jewelry design captures the zeitgeist of a truly remarkable period in history known as the Roaring Twenties. People found reprieve in speakeasies during the era of Prohibition, and self-binding chains of the Victorian age were clipped loose as people began to exhibit the free-spiritedness of a culturally prosperous and thriving era. Edwardian and Art noveau styles of jewelry were brushed aside for more brazen cuts of white gold and platinum. In 1915 white gold was chosen over yellow as the price of platinum soared, and jewelry makers characterized the style with filigree cut-outs and caliber-cut stones placed compactly in geometric patterns. Diamonds were no longer just a luxury of the upper class; they became an affordable luxury for the everyday couple, as everyone benefited from the prosperity of this period. Jewelers were also implementing new casting techniques during this time. Intricate cut-outs were achieved through the use of die-cast machines, which allowed for greater precision in creating straighter lines and well-defined curves. Jewelers also placed bold accent gems in their work, such as sapphire, emerald, and ruby, which women wore underneath their cloches and paired with other flapper fashion. After experiencing the atrocities of World War I, people needed outlets to express their individuality, and fashion allowed them to do that publicly. The attitudes of women were reflected in the styles of clothes they wore, as well as the art deco jewelry that patterned their necks and wrists. 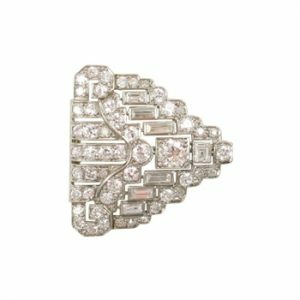 Art deco jewelry is elegant and timeless, and that’s why we carry a large selection of these beautiful pieces at Frank Pollak & Sons. Browse our unique inventory of vintage jewelry here.